Last Friday was a massive night for the Brisbane Lions’ recruiting team with a handful of top end picks up their sleeve. According to Recruiting Manager Stephen Conole everything ran smoothly on the night. “It all went to plan,” Conole said. 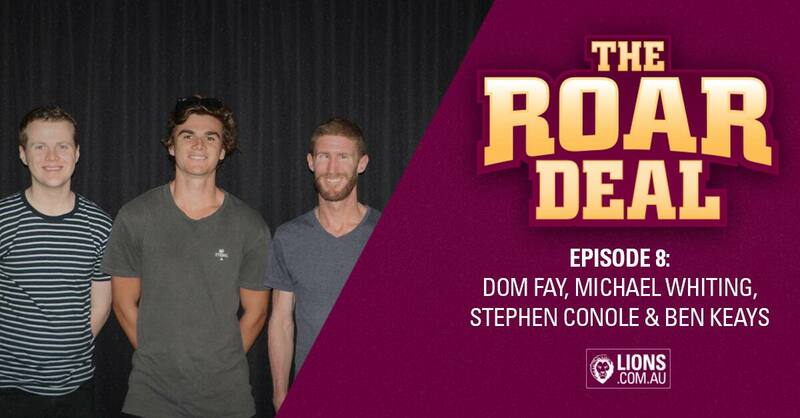 Conole joined Dom Fay and Michael Whiting on The Roar Deal podcast to review the 2017 Draft night and as Fay mentioned, the number one pick wasn’t the only great outcome from the night. “There’s so many other new faces to take the pressure off Cam Rayner at number one,” Fay said. Whiting was quick to agree, recognising that aside from the top Draftees, there were also some great traded players to join the Lions in 2018. “There’s Luke Hodge and Charlie Cameron too – the entire league is excited about them.” Whiting said. Brisbane Lions player Ben Keays also joined The Roar Deal this week, sharing the same excitement for what’s to come next season. “You’ve probably heard it over and over but it’s true,” Keays said. “The optimism around the Club is fantastic and it just comes down to the little things that are happening. “Guys like Dayne Beams and Dayne Zorko have been polling really well on the Brownlow, despite being such a low finishing team. Keays was quick to admit that he was hopeful these new Draftees would witness something exciting during their time at the Lions. “It’s hard to image that we are not going to rise again,” Keays said. “Fagan uses the analogy that improvement is never straight up, there’s always bumps along the way.